The original Atari’s last home system, the Jaguar – ill-fated from the start. I picked mine up as new-old-stock from a closeout internet retailer after it had been discontinued – a good deal at $35. The system was new, but the box was a little bit beat up – obviously it had been sitting on a shelf for quite a while, and shuttled around on various trucks to and from various stores and warehouses before finally ending up at the liquidator from which I purchased it. It was apparently a system that nobody else wanted. It was pretty obvious that this system was doomed right from the beginning. 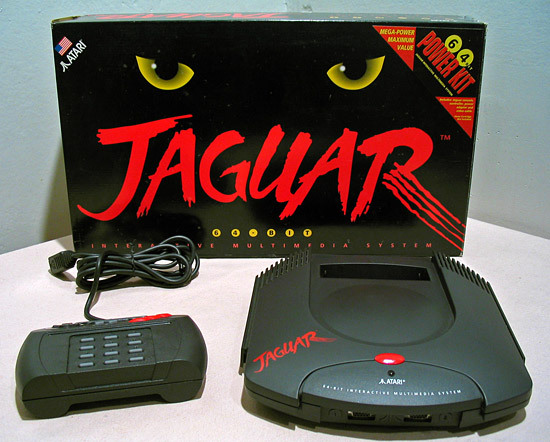 For one thing, by the time it was developed, the “old guard” at Atari were long gone, and few people there had ever tasted success in home consoles, let alone had any idea what they were in for. The system development was outsourced, and it was actually built by IBM. Atari had very little to do with anything but the marketing – and the marketing was pretty much crap. The system itself is, in practice, about as powerful as the Sega 32X. It’s barely able to push around a few untextured polygons at a time (see the screenshots section at AtariAge), which wouldn’t be so bad if Atari had focused on its 2D capabilities rather than trying to push it as a 3D system. The end result was that it was destroyed in the 16 bit era by the 2D prowess of the Genesis and SNES, and it was destroyed in the 32/64 bit era by the 3D capabilities of the PlayStation, Saturn and N64. It didn’t help that it was extremely difficult to program for, which was only one factor in the lack of third party game development. 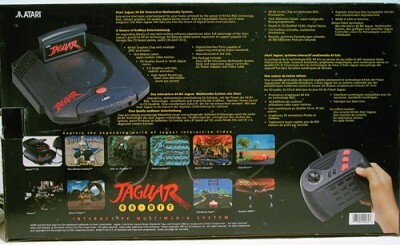 There are really only a few great games for the Jaguar. Made in the USA. Atari Corp, Sunnyvale, California. Just like it was in the glory days of 1977 (albeit with a few changes of ownership in the years since). I’ve been told that my unit is one of the rarer “M” units, vs. the original and more common “K” units as denoted in the serial number. The main difference is apparently the combination of the two custom chips into one, with a few bug fixes included in the process. 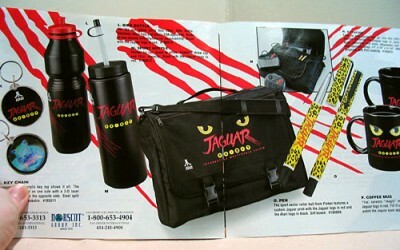 Astute viewers will note that this catalog is worth $1.50. Anyway, inside this catalog are not games (because Atari didn’t really have any games to advertise), but actual Jaguar-themed merchandise. Some of this stuff I have never personally seen in real life, including (and I need to take a pic of this at some point) an honest-to-god acid-washed denim jacket. 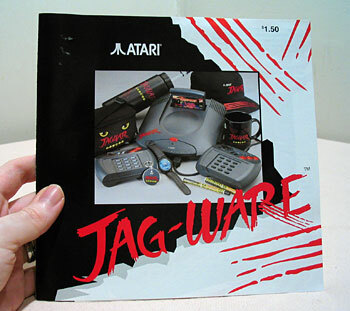 Apparently, Atari was stuck in the 1980’s (as if the whole claw-mark thing and leopard prints on everything didn’t convince you of that earlier). Obviously, all the other stuff you see on this front pic is in there too – pins, a watch, pens, a hat, mugs, etc. Also t-shirts, black jackets with the Jaguar logo on the back, and more. If anyone has any of this stuff and wants to get rid of it, please let me know – I may be interested depending on price. I must have that bag. I have messenger bags for the PS2, GameCube, maybe one or two other systems, but that’s by far the coolest console bag I’ve seen.